The facade of the statehouse. When the National Road was built, it carried transportation importance not only as a gateway west, but also as a link between western state governments and the East. The road itself passes through three former state capitals – Wheeling, W.Va. (several times in the late 1800s), Zanesville, Ohio (1810-1812), Vandalia, Ill. (1819-1839) – and two current state capitals – Columbus and Indianapolis. 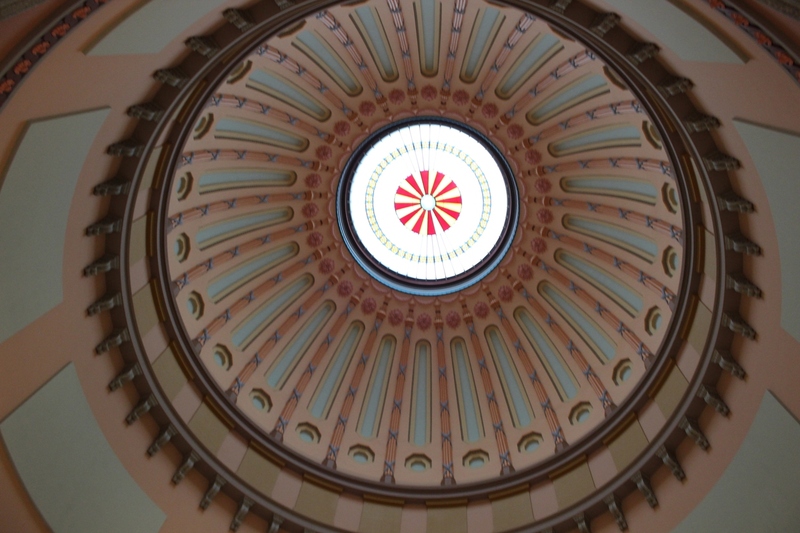 The dome in the rotunda of the statehouse. In all of these locations, the National Road passes directly by, or very close to, the state capitol buildings. In Columbus, the Ohio Statehouse fronts the road (Broad Street) on its northern side. The current statehouse was completed in 1861, after fire destroyed a previous building. The building is consistent with Greek Revival architecture, and the self-guiding tour brochure states that the idea to construct the capitol in this style came from a desire to create a structure that represented democracy, which was, of course, developed in ancient Greece. The statehouse was renovated during the early 1990s, which restored much of the detailed interior architecture seen in the building today. 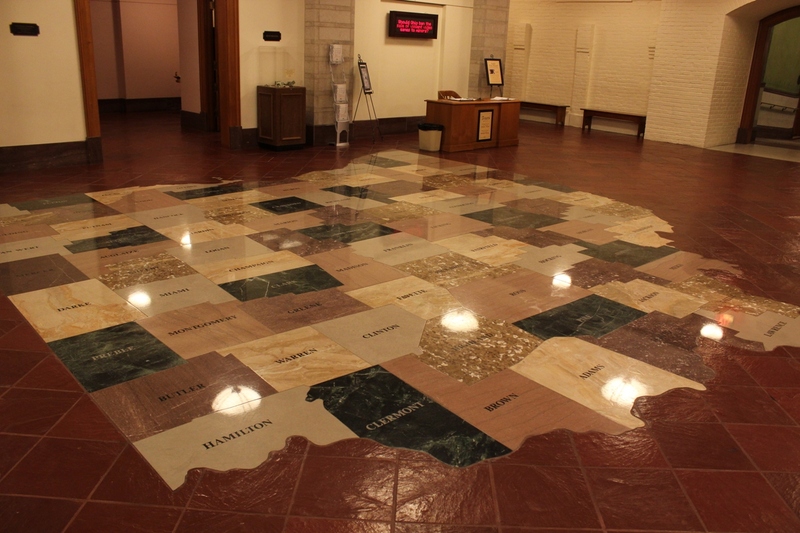 In addition, the statehouse was fused with the Senate Building via an enclosed atrium, and the lowest level of the structure was renovated to serve as both a lower connection between the buildings and as a better facility for visitors. The entrance to the Statehouse Museum. Visiting the statehouse today is quite easy. A public parking garage exists under the building, accessible from Broad, Third or State streets. 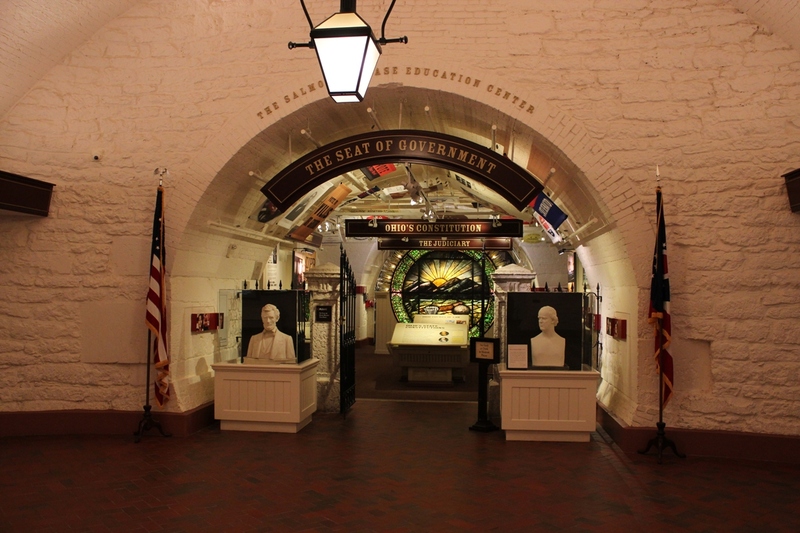 The garage leads directly into the lower level of the capitol, where a small, but modern, interactive museum features exhibits documenting politics and government in Ohio. Guided tours are free and given throughout the day, or guidebooks are available for a self-guided tour, which is what I did. The mural for which the “Map Room” is named. Because the statehouse and Senate Building are essentially one building, it’s a little easy to get disoriented at first. 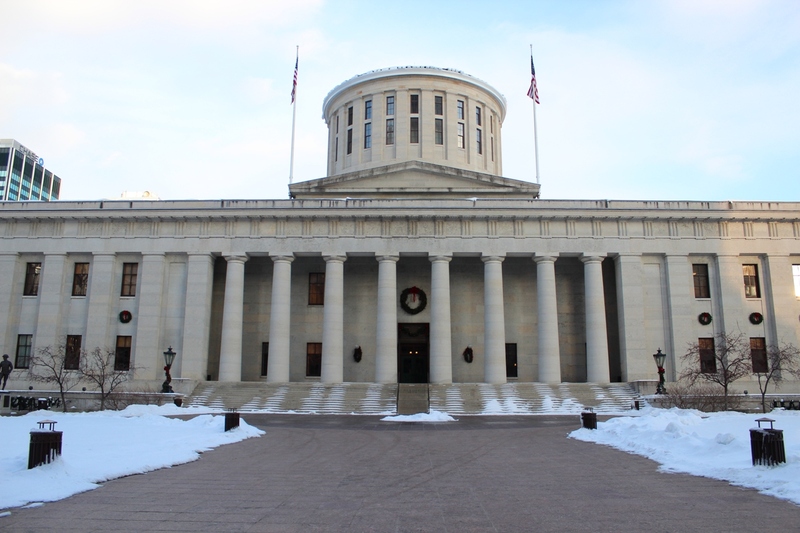 However, the statehouse is secured with a division of the Ohio State Highway Patrol, and those officers can be of assistance. The self-guided tour leads through each level of the building, noting the function of nearly every room on each floor. The guidebook provides detailed information on each location, and also contains photos and descriptions of what parts of the capitol looked like before the 1990s renovation/restoration. 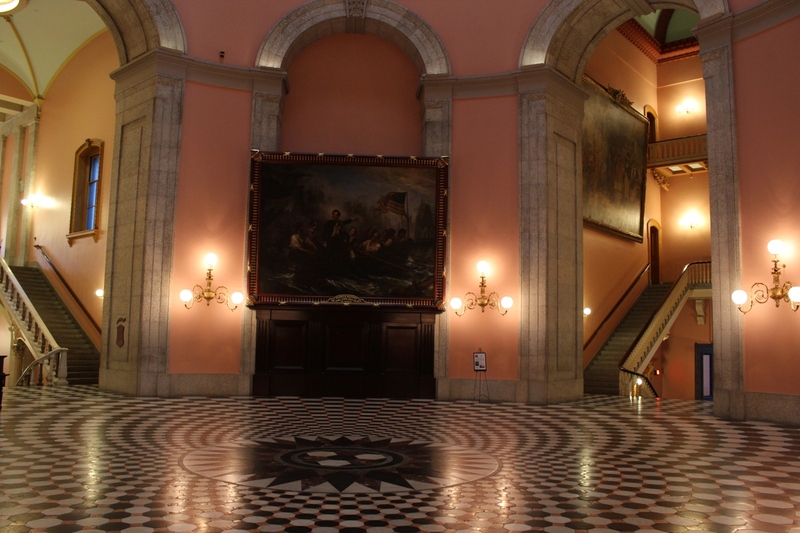 One aspect of the Ohio Statehouse that makes visiting pleasant is that the whole building is very open and visitor-friendly (at least when the Ohio General Assembly is not in session). 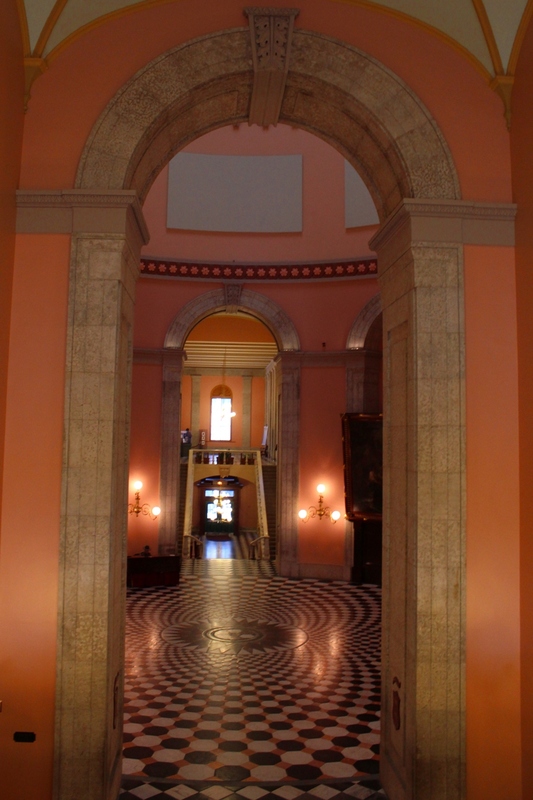 Visitors are able to walk freely in and out of the building’s entrances, and even the House and Senate chambers are open to the public (again, as long as the legislature is not in session). This atmosphere allowed me to enjoy and take in the building at my own pace, without feeling rushed. The highlights, at least in my mind, are The Rotunda, the House and Senate chambers, the Statehouse Museum and the grounds around the building. Of course, there are scores of other features the capitol has to offer. 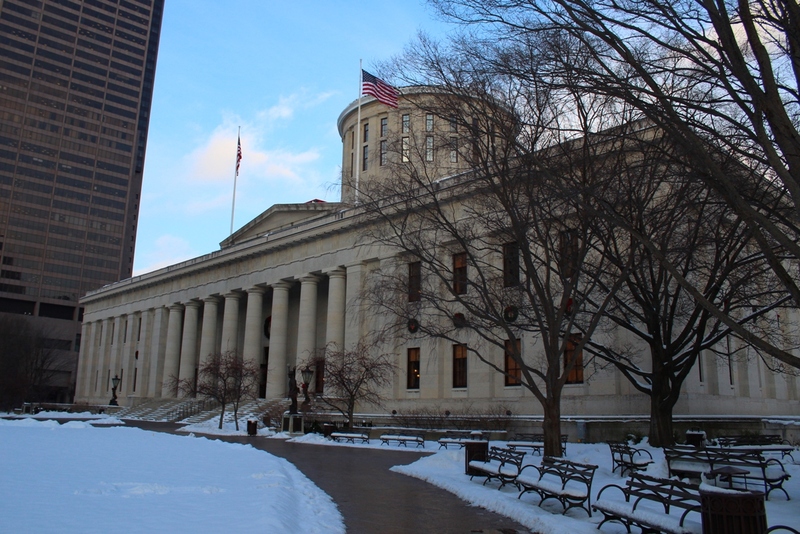 The Ohio Statehouse is open to the public Monday through Friday from 7 a.m. to 6 p.m., and on Saturday and Sunday from 11 a.m. to 5 p.m. The “Palm House,” the original building of the conservatory. I happened to be at a wedding in Columbus at the Franklin Park Conservatory in Columbus, which just so happens to be right along Broad Street – the National Road’s route through Ohio’s capital. The conservatory is a large, public botanical garden with indoor and outdoor sections. The indoor sections are separate greenhouses, each with a different environmental zone in the world, from the Himalayas to the tropical South Pacific. Some zones are interactive and allow you to hear information about the plants by calling a specified number from a cell phone. The South Conservatory houses a large seasonal butterfly exhibition in a tropical Pacific biosphere – although the presence of animals is absent from all other parts of the facility. The outside part of the conservatory is a combination of horticulture and sculpture. Paths snake through the gardens, with benches set throughout the park. The Pacific Islands zone. A Chihuly glass sculpture is on the left. In addition, Franklin Park also has its own in-house glass furnace, staffed by rotating glassblowers. The glassblowers give demonstrations throughout the day, and also offer glassblowing classes to the public. 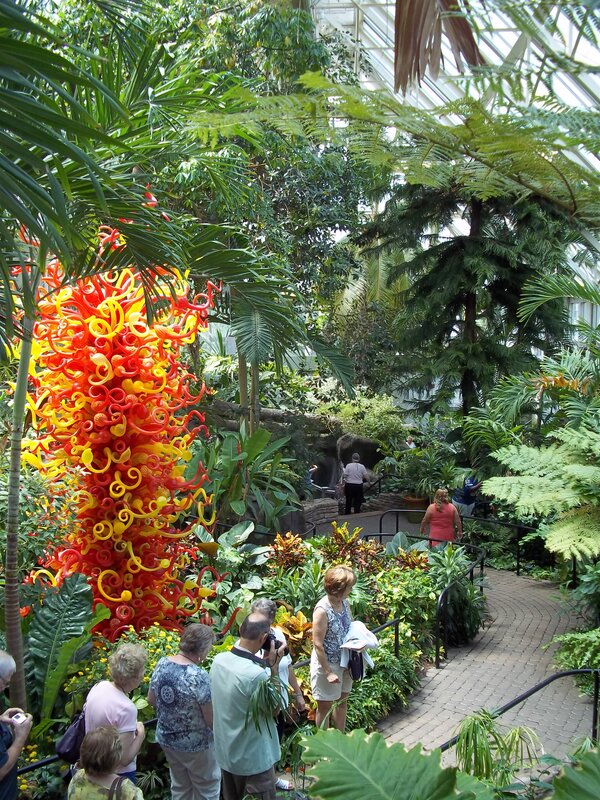 The conservatory also promotes the work of glass artist Dale Chihuly, the works of whom are found throughout the conservatory, intermingled with the flora. Some of Chihuly’s glass art is also for sale at the conservatory’s gift shop, though it’s a bit pricey (think around $5,000 to $10,000). Franklin Park Conservatory is nothing new to Columbus, and is on public land (Franklin Park). 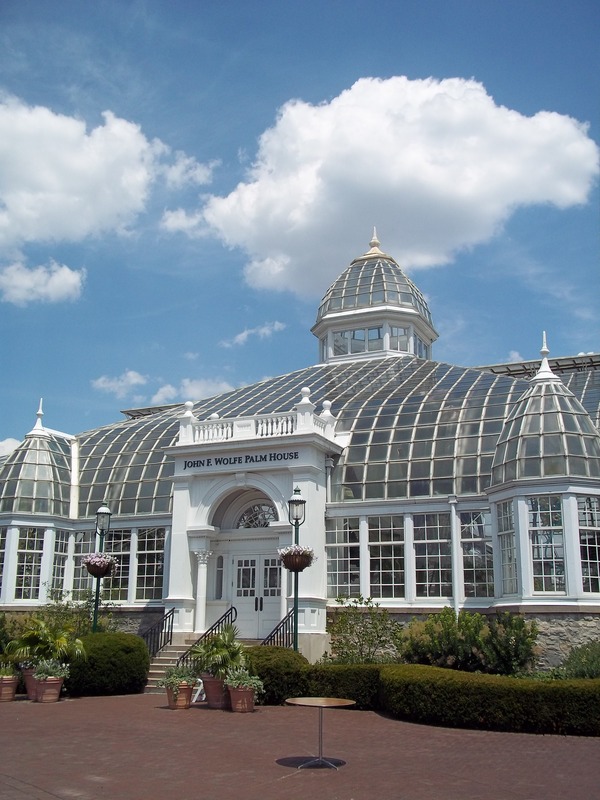 The first structure of the modern conservatory was built in 1895, which is the back part of the building today and called the “Palm House.” Before that date, Franklin Park had served as the location for the Ohio State Fair. Since the first greenhouse was constructed, several additions have been made onto the building including the glassblowing furnace, a gift shop and a cafe. The conservatory has also hosted numerous weddings and events and possibly the most significant event in its history – AmeriFlora ’92, which attracted over 5 million visitors during its six months. However, despite the importance of the event (some of the outdoor park was constructed for AmeriFlora), the event apparently caused the Franklin Park Conservatory to have financial and management issues. Those issues resulted in the conservatory’s management to be somewhat restructured. 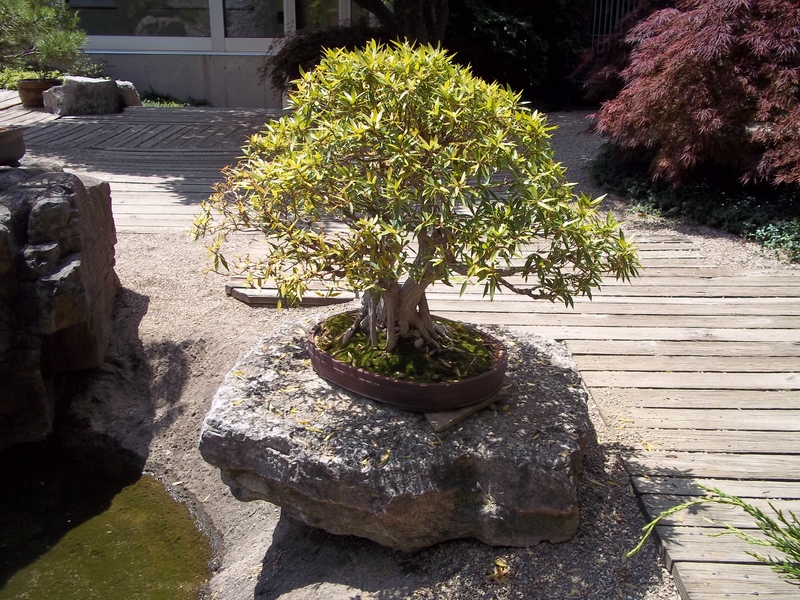 A bonsai in the conservatory’s Bonsai Garden. Regardless, the conservatory has continued to grow and become stronger financially and has been implementing a master plan for the present and future. The entire facility is kept up to date, informative and clean. For those with a deep interest in horticulture, at least an entire day could be spent touring the gardens and greenhouses. But even for those without a huge plant interest, the conservatory is worth a visit of a few hours. There is a fee to enter the greenhouses – $11 for adults, $9 for seniors and students and $6 for children 3 to 17. It’s open every day from 10 a.m. to 5 p.m. and Wednesdays from 10 a.m. to 8 p.m. Ample parking is available in front of the main entrance. General information can be received by calling 614-645-5926 or visitorservices@fpconservatory.org.